The internet has no shortage of online guitar lessons. But good ones that actually get you places? Those are few and far between. Enter Infinite Guitar. Grab your axe and let's have some fun! See what Infinite Guitar is about Get Free Lessons Instantly! Excerpt: In this second section, we'll look at how to add "extension" boxes on to the normal box shape we covered in the first section. This will allow you to cover a lot of fretboard quickly, and it's very easy to get under your fingers! Excerpt: In the final section, we'll cover how to prepping pots for soldering, how to use solder wick to remove excess solder and how to cleanly connect wires to different points on a pot. Excerpt: In the final section, we'll explore the octave shape that this tuning affords us on the low string. Finish up with some nice aggressive galloping pick strokes and you have a killer metal riff! Our company name, Infinite Guitar, signifies how the guitar is indeed infinite. There is always more to learn and more creativity to tap into. Our guitar teachers build upon this core principle within their lessons. We'll help you learn the technicals, but more importantly we want to inspire you and open your eyes to how amazing the guitar truly is, and the potential you can have with it. We have guitar teachers from all over the world and they're some of the best talent in the business. Check out our free guitar lessons to get a taste! Not only are our lessons useful, we also have many cool features that make your learning experience even better! Left-Handed Players: flip all images and video horizontally! You want to be a better guitarist, and our goal is to help you get there. Whether you're a total beginner, an intermediate in a rut, or a seasoned professional looking to be challenged, our guitar lessons can propel your skills well beyond their current level. Our lessons are fun, applicable, and accommodating to your preferred learning pace. Want quick lessons to learn new licks? We've got those. Want in-depth tutorials that will take you days, if not weeks, to digest? We've got tons of those too! Let's face it, going to a local music shop to get lessons is not convenient or cheap. While face-to-face lessons can be beneficial, online guitar lessons can have big advantages over local lessons. You know that feeling when you have a breakthrough with your guitar? When something clicks and a piece that was difficult suddenly comes together? I've had several of those moments since joining Infinite Guitar. Each milestone was due to hard work and the excellent lesson material available on the site. If you take your guitar playing seriously and want to advance as quickly as possible, don't hang around and wait, become a Full Access member. IG is the best guitar tuition site, bar none! My transformation since joining in September has been unreal and I couldn't have progressed this far without the site. I must say for the few months I've used IG, it's given me more insight into my playing than I've gotten the past 2 years. There is a lot here, varying in difficulty and playing styles. There is something for those interested in metal and those more into jazz, funk, and blues. IG will help you get a grip on techniques from downward slides to multiple finger-tapping, from different approaches on muting, to 7 and 9-tuplet legato runs. Everything I need is here. The material at Infinite Guitar is really a new dimension for me and my guitar playing. All sorts of styles. That's what I'm interested in. And that's what I got with buying Full Access for a really small amount of money. A big thanks to the IG instructors for putting such a great effort into all of this and for making magnificent guitar lessons with enthusiasm! I originally had no intentions of joining a tuition-based guitar instructional site. 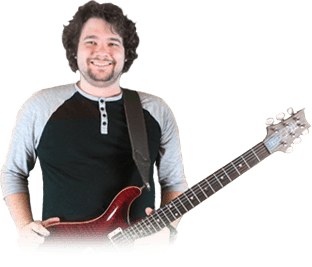 Once I checked out Infinite Guitar, I was very impressed by the diversity of topics, the teaching and performing quality of the instructors, and the overall look and feel of the website. Becoming a member has proven to be a fun and invaluable learning experience for me! Since becoming a Full Access member at Infinite Guitar, I can honestly say it's been the single best choice I've made this year! As a guitar player, I know I'm learning from the best. The instructors are extremely professional. All in all, Infinite Guitar has been helpful and it showed me the way. This site and the instructors made me fall back in love with my guitar! This is the first time I've signed up for anything like this. The guitar lessons are top quality. The lesson explanations are just right. Awesome! I have to say that I LOVE THE SITE! Amazing breadth of content and an example of what online instruction sites should be like. Hey team, your site is most helpful in unlocking some of the mysteries of the guitar. My hat is off to all of your contributing teachers. Their skills are a testament to their passion, dedication and discipline.